Trying to decided which brand of rebar cutters is the best? 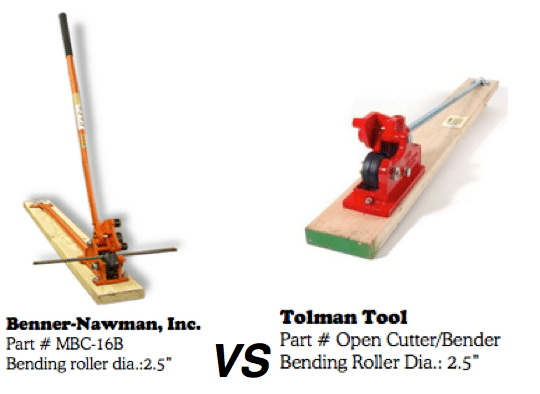 We conducted a side-by-side comparison of manual rebar bender/cutters from Tolman Tools and Benner-Nawman, Inc, each with a bending roller diameter of 2.5 inches. In our trial, we used both tools to create 90- and 180-degree bends in rebar #5, #4 and #3. The results were based on the ability of the tool to produce a 90-degree bend with one swing of the handle, or a full 180-degree bend with two swings of the handle. Only one tool passed the test. As you can see able, the rebar cutter from Benner-Newman, Inc. successfully created both 90- and 180-degree bends in all grades of rebar tested. The Tolman Tool, on the other hand, managed only to create adequate 90-degree bends in grades #5 and #4. For all three grades of rebar, it failed to create proper 180 bends. In this small study, only one tool made the cut: the rebar cutter/bender from Benner-Nawman, Inc.